As the state of emergency is extended in France in the wake of the recent Nice terrorist attacks, the French public is beginning to lose faith in the State’s ability to protect them. But will they ever really understand the true function of the imperial State? it carried out false-flag terrorist attacks in France, blaming them on Muslims. ‘Islamist’ terrorist attacks serve Zionism’s agenda of taking over the Middle East as they demonise Muslims and Arabs, thus criminalising legitimate resistance to Israeli colonialism. ‘Islamist’ terrorism also drives the Zionist agenda, referred to by Samuel Huntington as the ‘clash of civilisations’ – the idea that Muslims have no place in ‘Western civilisation’. Although the truck slaughtered over 84 people and injured hundreds more, there was no blood visible on the published photos of the vehicle. Perhaps there is a simple explanation for this apparent discrepancy. I hope to see a good ‘debunking’ video or article of the blood problem soon! 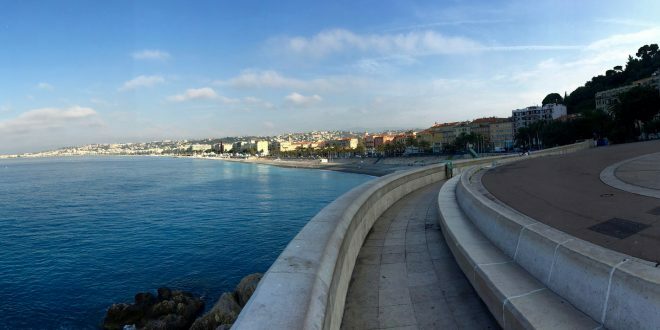 We are also informed that police opened up the barricades to the Promenade des Anglais minutes before the attack. There have been reports of up to four trucks in the area that day. Trucks are not authorised to drive through streets during festivals or national holidays. France is in a state of emergency! How is all of this possible? Bouhlel, who was married with three children, was said to have been a practising homosexual in a relationship with an unknown 73-year-old man and frequenting gay bars in the Tunisian city of Souse, where Mossad have an office. Mossad has increased espionage in Tunisia since the US/Israeli fomented ‘Arab Spring’ in 2011. The truck appears to have been parked for nine hours near the Negresco Hotel, which is an infamous gay locale in Nice. Homosexuals, who are often the victims of child abuse, are sometimes used by intelligence agencies as double agents and patsies. The terrorist’s sister told the media he had had psychological problems. He is said to have been suffering from a nervous breakdown. Bouhlel had all the classic characteristics of an intelligence patsy. Most interesting of all is his own video proving that he is still alive! Although the US/Israeli-created ‘Islamic State’ has been blamed for the Nice Attack, Bouhlel does not seem to have had any links with Islamist organisations. In fact, his profile is remarkably similar to that of Saleh Abdeslam, who was blamed for the Bataclan attack in Paris in 2015, and Omar Mateen in Orlando. Both were homosexuals, narcotic and alcohol abusers, and petty criminals already known to the police. Saint Anselm epitomised the spirit of Medieval Christendom in the concept of fides quaerens intellectum – faith seeking understanding. The faith of the people in the transcendental authority of God as revealed in the scriptures was supplemented with increasing understanding of their meaning through human reason. Since the French revolution the bourgeois state has supplanted divine authority and citizens are indoctrinated into the belief in state infallibility concerning observance of the principle of the rule of law. Hitherto, there has been widespread faith in the bourgeois state and understanding of its mysteries has been copiously provided by its myriad sacerdotal institutions. But it now looks like this holy war may be undermining people’s faith in the bourgeois order and its catechism of human rights, democracy and freedom. The French people are losing faith in the government, the police, and the system. They are beginning to understand that they are governed by incompetent fools and possibly even by psychopaths. It is difficult to believe the story of what happened in Nice. We are told that Bouhlel was shot dead. But another suspect was seen being arrested by police at the crime scene. Who is this suspect? Was there a second terrorist or did Bouhlel rise from the dead? Some videos of the massacre scene posted on line appear to show dummies rather than dead bodies. The authenticity of those videos cannot be verified. But there is little that can be verified in these terrorist attacks as the highly paid press reporters who the public believe ask hard questions and investigate terrorist attacks do not do so. On the contrary, they smugly attack and ridicule citizen journalists and Internet activists for seeking the truth. There are too many unanswered questions. The public is being told to believe a story for which there is scant evidence. Why should they? Why should they believe governments that serve the interests of foreign bond-holders and bankers? Why should they trust a ruling class who, instead of fighting to raise the material, cultural, moral and intellectual welfare of the people, do the opposite, attempting at every opportunity to rob, acculturate, demoralise and stultify the masses? The French government is now encouraging youth to join the army reserve. It may become treasonous not to enlist. We are passing from an era where dissent is ridiculed towards an era where dissent is criminalised. In his work “The Republic”, Plato described oligarchy as a city-state where the rich are constantly conspiring against the poor. Aristotle in his book on Politics notes how Greek tyrants would take oaths to protect the interests of their class by conspiring against the masses and, in an era long before the surveillance systems of today, Greek tyrants would force citizens to congregate in special areas of the city so that the state could constantly spy on them. The extraction of surplus value from labour is the primordial conspiracy against human creativity. Is it inconceivable that terrorism would be the art of governance in a world where finance capital and the moral turpitude it engenders, triumphs over honest labour and solidarity; where enterprises of lies and war flout all laws; where the poor man is locked up for minor misdemeanours while wealthy war criminals walk free? Is it inconceivable that such a class of people would orchestrate the most facinorous conspiracies against the people? Lenin described the state as the means by which one class represses another. We live in a class dictatorship – where those with property and power use every means necessary to keep the masses under their control. Human freedom is, as Jack London described it, crushed under an iron heel. The entire matrix of commodity production is predicated on lies and deception while man is beholden to its infinite spells and fetishisms. In the society of the spectacle, who cares if white trucks can slaughter crowds and remain unbesmirched with blood or executed terrorists rise from the dead? Who cares if everything we are told militates against reason? The masters of discourse have a new story for the poor toilers of this world; it is short,simple and palatable enough to be consumed on a junk food break. We need more security, more surveillance, more war, more respect for wealthy Jews, and more contempt for poor Muslims. The world is run by forces beyond our control. Therefore we must submit to the all-merciful police state which is trying to protect us. Those who seek understanding before faith are now terrorists. The French have more than most Europeans, gone out onto the streets of their ‘Republique’ and demand their working rights, their Liberté égalité fraternité from their Governments but over the last couple of decade, their country has become Zionist occupied and the French are too dumb , blind or indifferent to see the reality that has unfolded and they foolishly agree to the ‘Martial Law, Emergency Laws put into force for Security to ‘protect the People’ but all it has done is taking away peoples’ rights and freedoms and given greater suppressive power to the very people complicit with the Criminals executing these Terror attacks, a treasonous Collusion thus making them their own Government Leaders Traitors failing in their duty to protect the Republique and its Constitution that people like the Zionist Jews Sarkosy, Hollande [Dual Israeli Loyalists] and Zionist Valls have slowly eroded. This is a WAR against Islam by the Jews but portrayed as a war between Christians versus Muslims so that they can kill each other leaving a Faction of World Jewry psychopaths the freedom to take absolute power over our God given world as they demonise a religion they view as the only remaining faith based threat to them, Islam, having already infiltrated and destroyed the true Church of Christ.